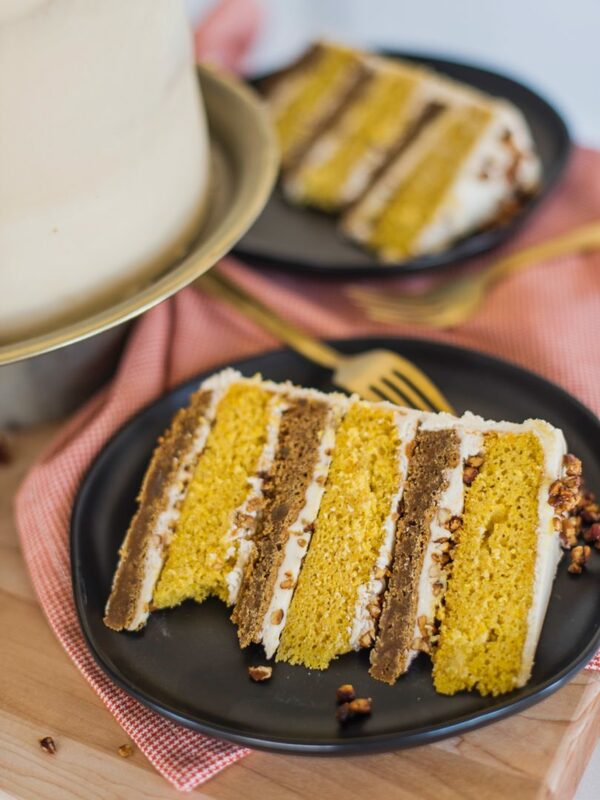 Butternut Squash Gingersnap Cake – Layers of moist butternut squash cake, gingersnap cookie and maple cinnamon cream cheese frosting. Ryan and I both travel quite a bit for work. Sometimes, we’re both on the road or working so much that it’s hard to find time for each other. Every year we try to plan a long weekend together. It’s nothing too big. Just the two of us for three or four days in a city we love. A couple years ago our getaway was in New York. I know I’m in New York a lot for work, and you’re thinking, “why would I go back for fun?”. Well, I simply love the city and never really get to enjoy it when I’m working. Plus, no matter how many times you’ve been to New York, there’s always something new to do or explore, and there’s always new food to try! Plus, my little sister and my best friend live there. Two more reasons I love NYC. Our weekend in New York was a bit rainy, but with umbrellas and rain jackets in tow, a little moisture didn’t stop us from having a good time and walking all over the city. It also didn’t stop us from getting ice cream at my new favorite shop in the West Village, Van Leeuwen Ice Cream. You guys! If there’s one place to try next time you’re in NYC, this needs to be it. (Or Doughnut Project around the corner – ahhh, just do both!). Of course we sampled just about every flavor on the menu, and by far, the vegan butternut squash brown sugar pecan cookie was my favorite. It blew me away! Creamy and flavorful, it consumed my thoughts for the entire weekend and ever since I’ve been home. 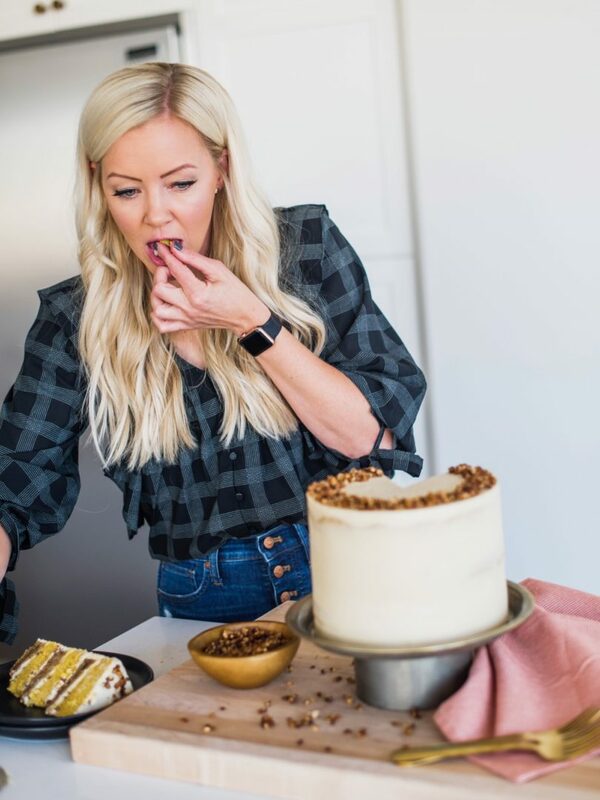 And per my usual thought process, with each bite of ice cream, I thought about how I could take the flavor combination and turn it into a cake. As soon as I got home, I started working on this ice cream inspired cake. I wanted to use all the flavors from the ice cream in the cake. 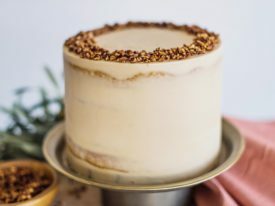 Here’s what I came up with: butternut squash cake layers, gingersnap cookie layers with candied ginger, candied pecans, and maple cinnamon cream cheese frosting. I was pretty excited about this cake but nearly had to pick up my jaw off the ground once I sampled it. The flavors in this cake scream fall and will make your taste buds dance with delight. Look at these layers! So many flavors and textures! 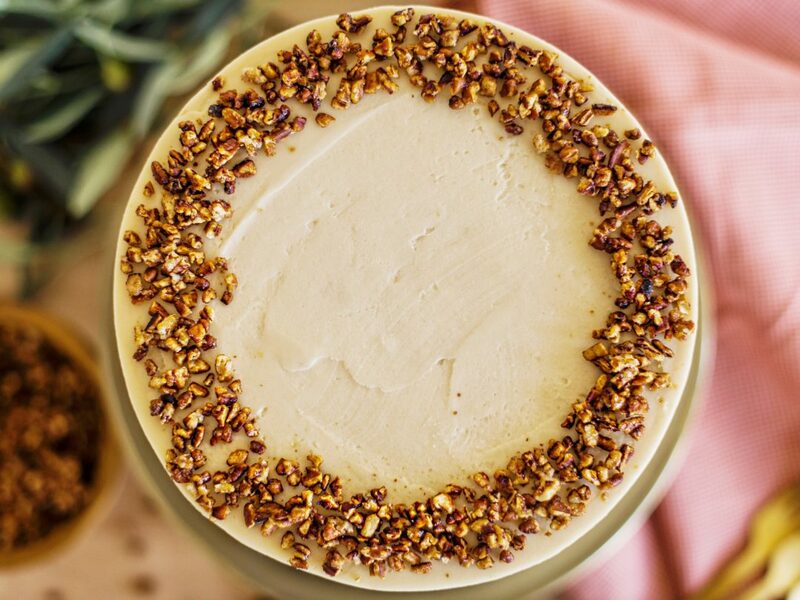 If there’s one cake you make this fall, this needs to be it! I can’t stop eating it. 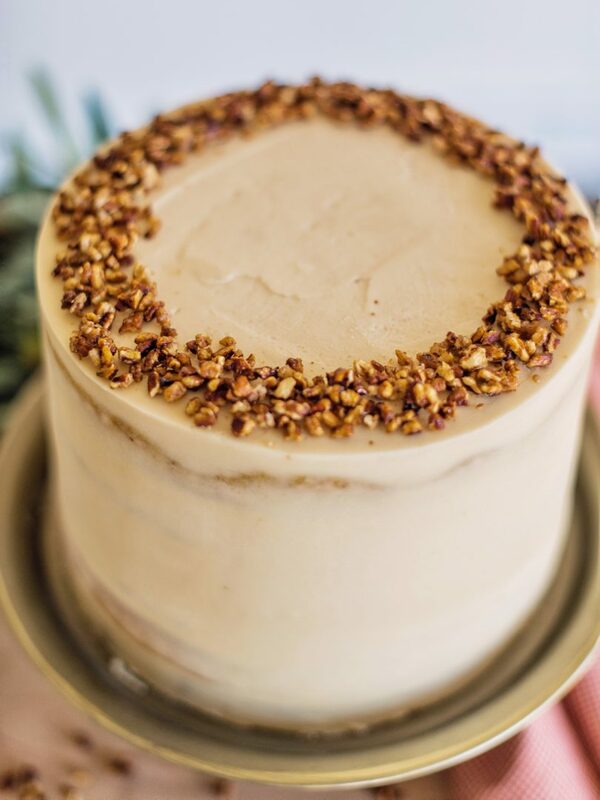 Butternut squash cake layers with gingersnap cookie, candied pecans and maple cream cheese frosting. Preheat your oven to 350 degrees F. Spray three 8-inch round cake pans with non-stick spray, line with parchment and spray again. Set aside. In a medium bow, combine the cake flour, cinnamon, baking powder, salt, nutmeg, and ground ginger. Set aside. In the bowl of an electric mixer fitted with the paddle attachment, beat the sugar and eggs together on medium-high speed until light and fluffy, about five minutes. Add the oil and beat on medium until combined. Add the cooled butternut squash and mix until combined. Add the vanilla. With the mixer on low, gradually add the dry ingredients. Stir until just combined. Mixture will be thin. Evenly distribute the batter into the prepared pans (about 20 ounces of batter in each of the three 8-inch round pans). Bake for 30 to 35 minutes, or until a toothpick inserted in the center of the cakes comes out mostly clean. Let pans cool on wire racks for 10 minutes before inverting cakes onto racks to cool completely. Preheat your oven to 355 degrees F.
Spray three 8-inch round cake pans with non-stick spray, line the bottom of the pans with parchment and spray again. Set aside. In a medium bowl, whisk together the flour, baking soda, salt, cinnamon, cloves and ginger. Set aside. In the bowl of a stand mixer fitted with the paddle attachment, beat together the butter and sugars until light and fluffy, about 2-3 minutes. Add the eggs, one at a time, scraping down the sides of the bowl in between each addition. Add the molasses and stir until well combined. Stir in the dry ingredients and mix on low speed until incorporated. Batter will be a little sticky. Fold in the candied ginger. Divide the dough in each of the three 8-inch pans (about 10 ounces of batter in each) and flatten with your hand to create a mostly flat surface. Bake the cookie layers for 15-17 minutes. Keep an eye on the cookie layers. You don't want to over bake the cookie or it will be too hard to cut with the cake. In an electric mixer fitted with the paddle attachment, stir the butter and cream cheese until light and fluffy, about two minutes. Gradually add in the powdered sugar with the mixer on low speed. Add vanilla, maple extract, and maple syrup and beat until light and fluffy, about 4-5 minutes. Combine the pecans and sugar over the stove on medium heat. Cook for about 5 minutes, stirring frequently, to coat the pecans with the melted sugar. Let cool completely before using. After leveling each cake layer, place the first cake layer, top side up, on a cake board. Spread about 3/4 cup of the frosting over the cake layer. Top with a handful of candied pecans, followed by one round of the gingersnap cookie. Apply another 3/4 cup frosting on top of the cookie. Repeat these steps until you get to the final cake layer. Place the final cake layer, top side down, on top of the last layer of frosting. Apply a thin coat of frosting around the entire cake to lock in the crumbs. Freeze the cake for 10 mins. After the crumb coat is set, apply the final coat of frosting with the remaining buttercream. I had enough for another thin layer of frosting. If you want a fully-coated look, make an extra 1/4 of the frosting recipe. Hi! I really enjoy your blog and IG but this is the first time I’m going to actually try making one of your cakes. I’m excited! Here’s my question. 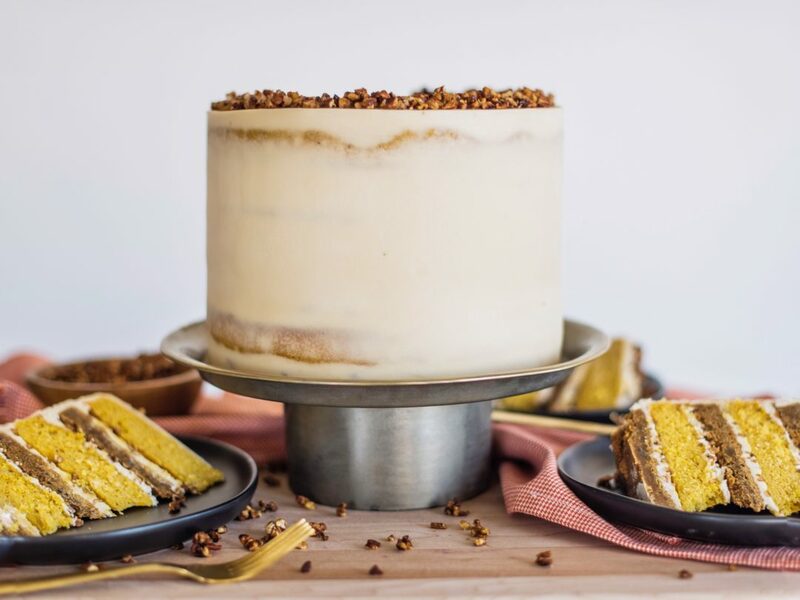 Will this cake be any less delicious if I leave out the ginger snap cookie layer? First, I’m not a fan of ginger snaps and second, I’d just like a soft cake without the harder cookie layer in it. You can certainly enjoy this cake without the gingersnap layer. The frosting and cake work great together on their own. How much cinnamon do you put in the frosting? It isn’t listed. Oh I’m sorry, I actually removed the cinnamon after testing this recipe again. I’ve revised the text. Yay! Can’t wait to try another one of your cakes!! This one will be first up for me because it sounds so intriguing. Q re assembly… the instructions say to start with a cake later on bottom and end with a cake later on top, but the pictures show to start with a cookie layer…? I’m thinking you really have to start with the cookie layer to end with a cake later, right? I made this recipe for my husband’s birthday over the weekend. When I told the kids it was going to be squash cake, I got some dubious responses, but the end result was fantastic! Universal thumbs up from everyone. The combination of the intense cookie, mild cake, crunchy nuts, and frosting all together was excellent. I was sooo excited try this cake!! I gave it a shot a few weeks ago, and the cake came out kind of flat, dense, and gummy, and the cookie was really thick. I got no complaints on the flavor and everyone who tried it was still completely obsessed, but I’m just wondering what might have gone wrong to make the cake layers turn out so strange? Hey Taylor, I’m sorry to hear the cake didn’t turn out right. It definitely sounds like something went wrong because that’s not the texture of the cake at all. In fact, it’s light and fluffy – not dense and gummy at all. My concern is that your oven temperature may be off internally from what it’s telling you on the screen on the outside of the oven. The cookie is a bit thick, but if you look at my pictures, it’s not as thick as the cake itself. Should be about half the height. Made this cake for the second time (I can’t remember how the batter was the first time) but this time my batter was very thick (like a banana bread). I weighed out my mashed squash and use the spoon/sweep method for my flour. The recipe says the batter is supposed to be “thin” is that correct? I still got 20oz of batter in each pan.